I wanted to list some products I especially used, or even discovered in 2014. I picked up the rarest, most strange/exotic, or simply very useful raw materials, synthetics or naturals. Cassie absolute (Acacia farnesiana): the key ingredient in a true-to-nature leather accord. Extremely powerful. Smells green, foliage (with hints of cabbage on topnotes), then it dries down on a powdery, dry, acidic, fatty hearth. Reminiscent of tanned leather. It is quite difficult to dose as the material has tendency to give off unpleasant topnotes (my personal opinion), difficult to mask in a simple composition. 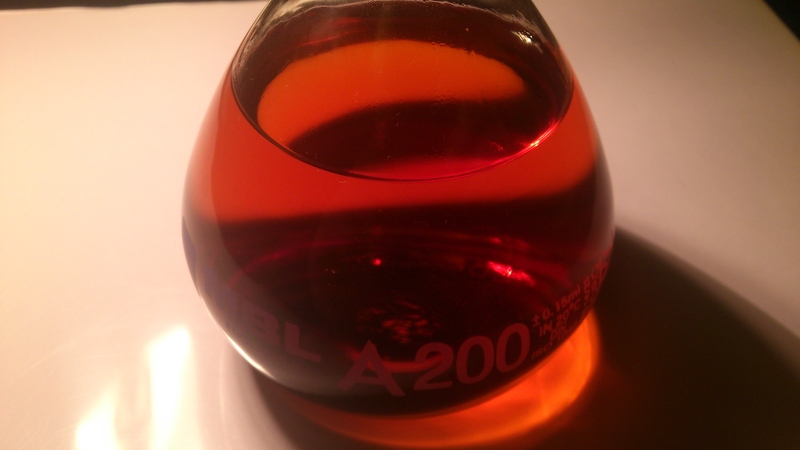 Musk Z4 (IFF): the same molecule as Exaltenone (Firmenich), but slightly more animalic, less sandalwoody, more close to Exaltone, with its metallic, extremely fine powdery facets. Quite powerful, more than Exaltone. Interesting to note that Musk Z4 solidifies at room temp (20° C), while Exaltenone is in the liquid state. Styrax resinoid: solvent, toluene, styrene-like topnotes, sweet and sharp. Slightly leathery (oldfashioned “cuir”), mineral, cinnamic, rubbery heartnotes. Sweeter, incensey upon drying. Interesting with floral notes (rose, orange flower). Cypriol essence: a nice replacer for agarwood (aquillaria spp. extracts), with bitter, green terpenic topnotes, rhubarb, vetiver-like, leathery. Quite powerful and longlasting, powdery, incense, sandalwood-like in the dryout. 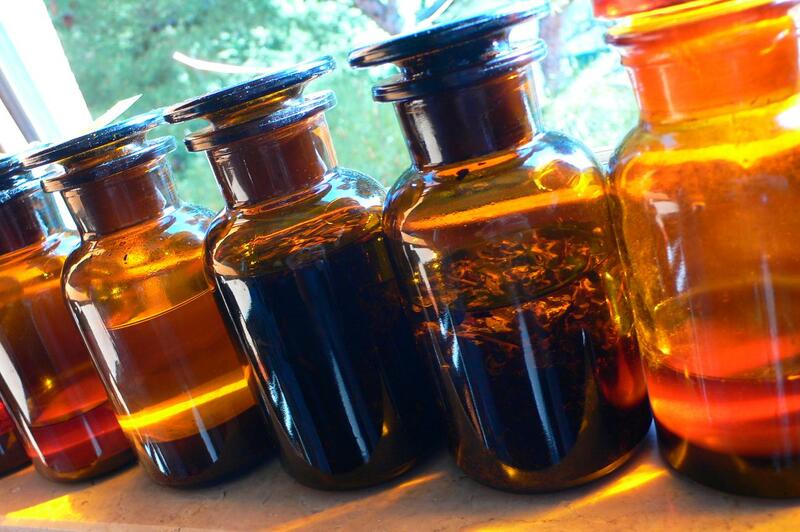 You can smell this orange, amber-coloured product in certain oud blends. Mate absolute: a beautiful green, tea topnote. 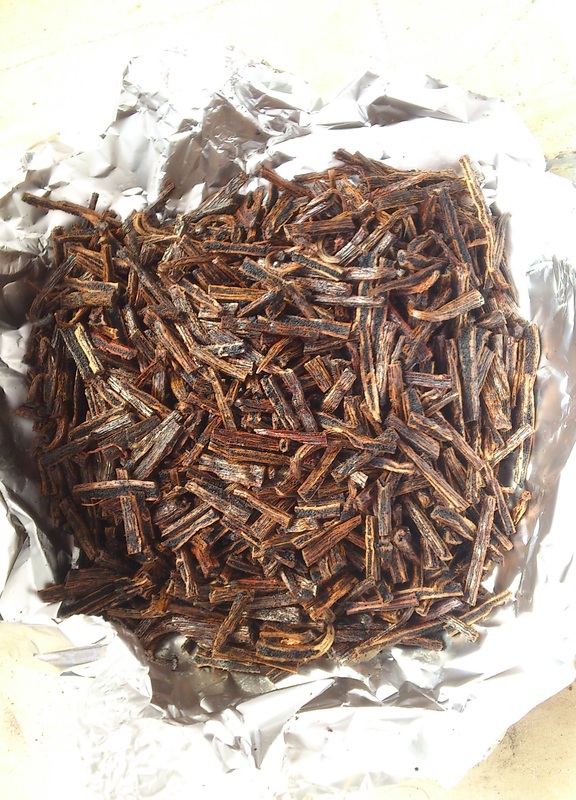 Bitter, dark, dense, smokey, very close to cured tobacco leaves upon drying. In the dryout it nicely resembles oakmoss absolute, with salicylate tones. Fatty acids esters: oily odour, at times slightly rancid, very interesting in leather accords and floral reconstitutions (mimosa, for instance). They are: Methyl/Ethyl linolenate, Ethyl laurate, Ethyl ricinoleate. Muskrat glands: in the 60s Arctander explained how this material was suggested as a musk deer replacer during WW II in the USA, but lacked the power of the original product. I wanted to try out this one and ordered some from a Russian supplier. Well, it doesn’t resemble musk deer in any way that could encourage its use as a replacer. It lacks the civet-like, animalic, skatolic notes found in the more prized material. It lacks its fine, well rounded, rich, powdery body. It smells less dirty, more fleshy, quite unpleasantly fatty and dry. It is more sebum-like. I am planning another order and I would like to suggest a different drying method. Muskrat glands are said to contain Exaltone (a molecule very close to muscone). I am not so sure to smell it in my product, but I can guess it is there. The tincture displays a nice ambery colour. Vanilla tincture prepared using comminuted vanilla beans (Madagascar) @10% in pure ethyl alcohol. The process is trivial: maceration of the beans in alcohol at room temp. for 9 months and filtration. The odour is quite satisfying, with a rich vanilla bouquet – similar to vanilla absolute though thinner and more volatile. The topnotes are not very convincing due to a certain sweet-woody note of sweet almonds. The body is a nice rich, dense vanilla. The dryout is a creamy vanillin. Not as beautiful as the resinoid or the absolute, but certainly easier to produce. I am now investigating the undesirable nuance of almond – I’d prefer to get a darker, heavier, even greasy accent instead of an almondy feeling. This same note is also perceptible in the hot extract I made (infusion). I am now producing new extracts, in order to make a comparison. An update on this subject is in progress. 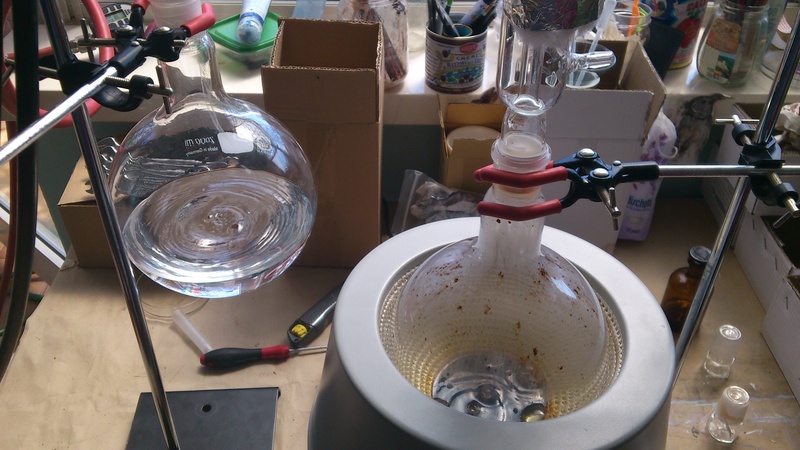 In this first attempt I tried to extract the aromatic principles of roughly 0,5 kg Bourbon vanilla beans (from Madagascar) by hydrocarbon percolation. 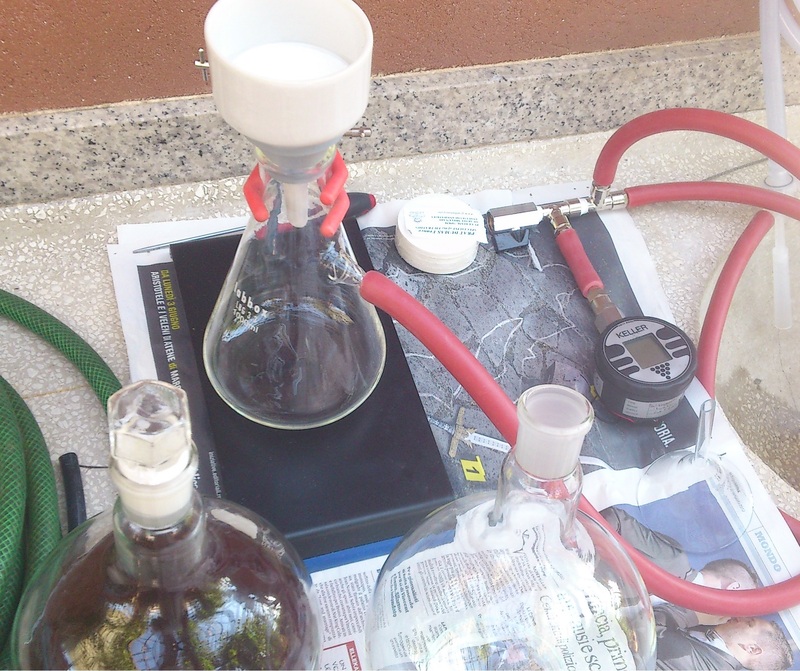 For this purpose I used n-hexane Scharlau 95% (120 euros 5 L canister). The extraction product is called an “oleoresin” (resinoid or concrète) because it carries a volatile fraction and odorless waxes and resins (I suggest you to read S. Arctander’s monograph on this subject: Vanilla oleoresin). I bought extraction grade vanilla beans: water content is kept low. I was quite satisfied with the overall “standard” odor quality of the starting material: “senza infamia e senza lode” (nor too bad nor too good). I only perceived a faint fermented type, volatile off-note when unpacking the beans. Apparently it was distilled off when evaporating the solvent, since it is not detectable in the oleoresin anymore (when disassembling the Soxhlet extractor after the process I was able to smell an acetic acid-like note on the top of the Dimroth condenser, while the recovered hexane did not carry such note). 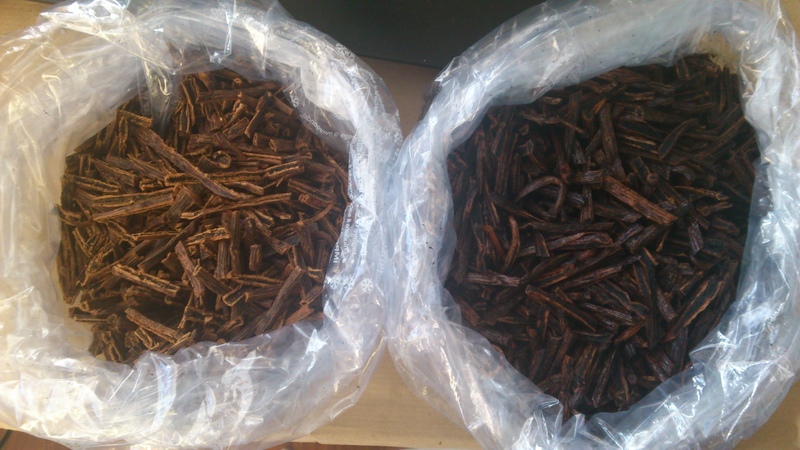 Comparison between exhausted (left) and fresh (right) vanilla beans. From this photo you can guess the extractive power of hexane: the vanilla on the left is drier and paler in color. It still carries some aromatic principles (not hydrocarbon-soluble material I presume). A Soxhlet apparatus is designed in order to recirculate the solvent throughout the botanical material. The temperature at which the extract is exposed is the boiling temp. of the solvent used. 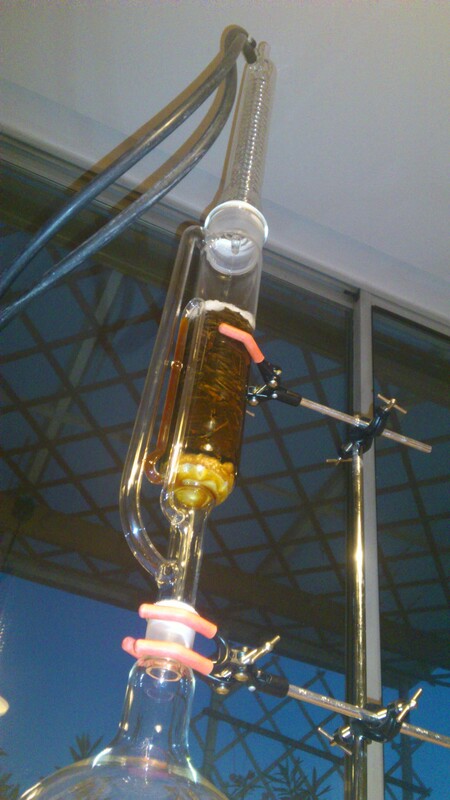 At standard pressure n-hexane boils at 68° C (relatively low). The raw material is not directly in contact with the boiling solvent, thus preserving it a little bit from excessive heating. In this first attempt I let the solvent recirculate 6 times (2 hours refluxing). The first run is, not surprisingly, the most charged with volatile materials, waxes and pigments (it is the darkest in color). The fourth is almost colorless. I let the extraction liquor stand for a day and then filtered under gentle vacuum. This process results in a small loss of solvent. 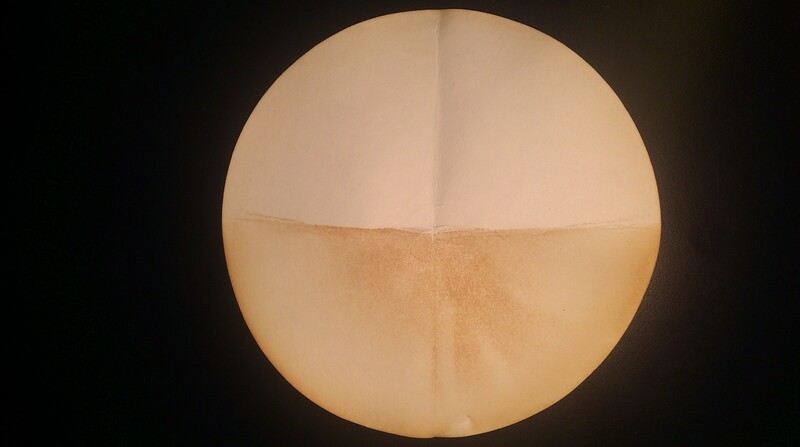 n-hexane is very volatile and vapors arise easily from the filter paper. It is the most troublesome phase of the process, when you are in strict contact with the solvent. I carried out this operation on the outside avoiding breathing too much vapors. I then evaporated the solvent under vacuum (pressure between 150-300 millibar) at ~30° C. It is really tricky to evaporate all the solvent. 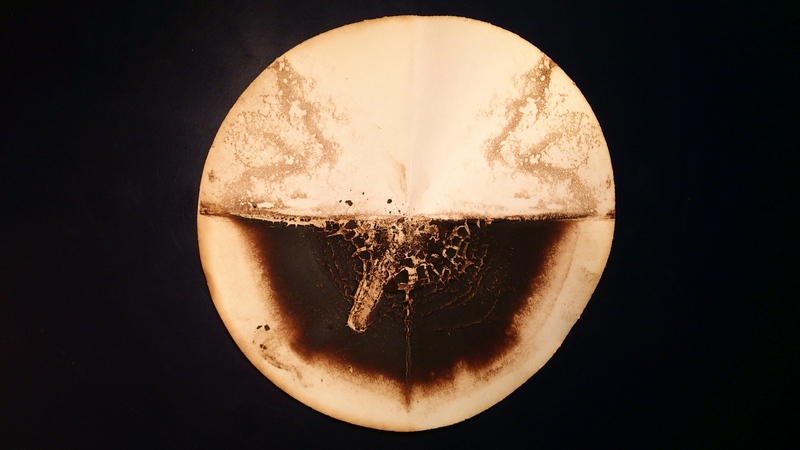 The last traces are the most difficult to eliminate: the temperature increases and there is the risk of spoiling the extract. A rotatory evaporator would give better results: solvent recovery would be faster and more efficient. I used a water vacuum pump: I can reach a pressure as low as 8 millibar, but in normal working conditions (heat, arising vapors) it is stable at around 150-200 millibar. A membrane pump would be more reliable. 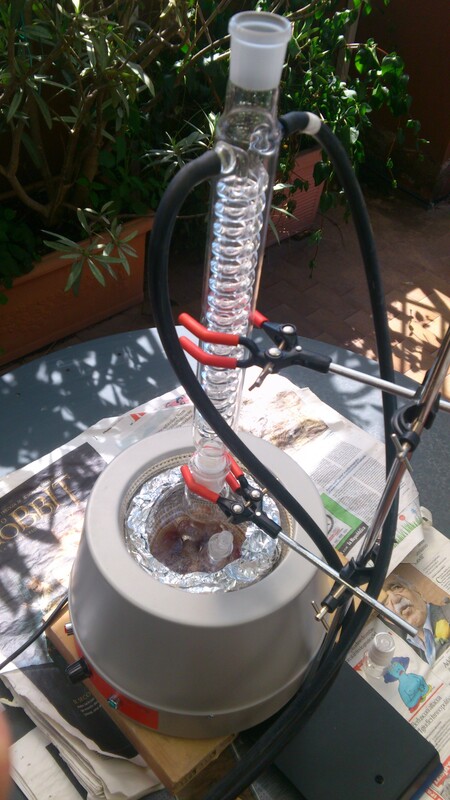 An ice trap would also improve solvent recovery and avoid vapor leakage in the air (I used a Dimroth condenser and recovery was very good, I registered only minor losses through the vacuum pump). 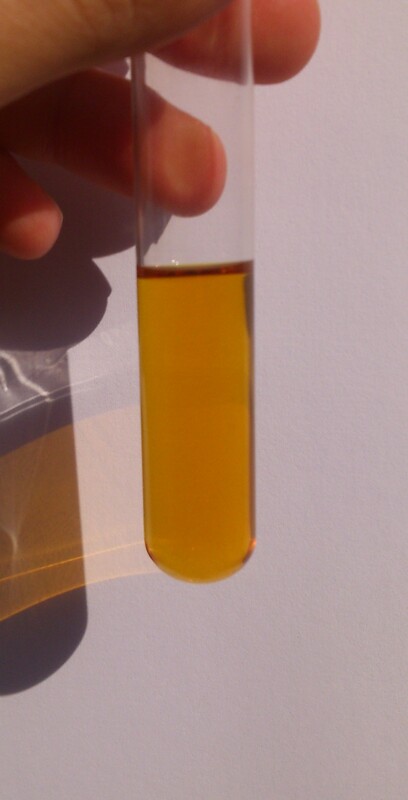 The yield was quite good: 31 g oleoresin from 471 g of crude vanilla beans (6.7%). I was able to recover most of the solvent (major losses were due to filtration and adhering solvent on exhausted vanilla). Vanilla oleoresin is a viscous, dark brown liquid not completely alcohol-soluble. It possesses a true-to-nature, rich and creamy vanilla aroma, with woody and licorice undertones and a tobacco nuance. It is not as powerful as a vanilla absolute, since it still contains odorless waxes and non-volatile material, but it possesses good tenacity. I don’t appreciate headnotes from this oleoresin very much: they are quite smoky-bitter, overly sweet to my nose. It may be a factor of concentration (too high to fully appreciate the extract) or there could be solvent traces (a gassy nuance? Not quite sure). I assume that during solvent recovery the temperature increased too much in the last minutes (bitter, smoky, burnt odor detected?). 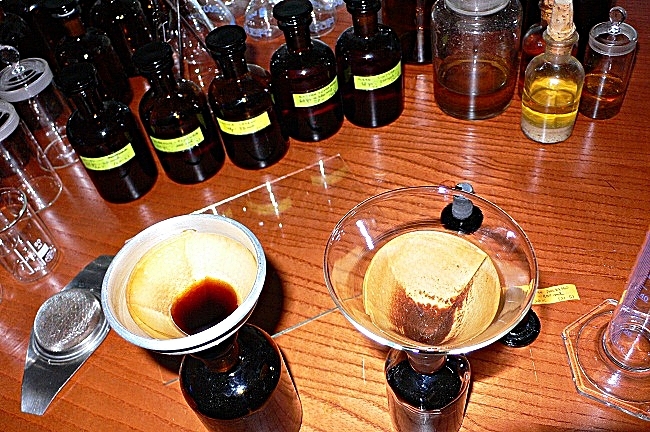 An hydrocarbon extraction followed by an hydro-alcoholic one should give better results: not complete alcohol solubility, but a much more complex and rich aroma quality. Tightly controlling the temperature is essential to achieve satisfactory odor quality.